Photo provided by Bram de Bruin. The Stone Circles of Senegambia are the largest group of megalithic complexes yet recorded in any region of the world. There are 1,053 Stone circles and a total of 28,931 monoliths. Their quality suggests sophisticated stone working traditions. All circles are found near to burial mounds. Their date and purpose are still a matter of debate. The 8 to 14 stones in each circle vary in size up to ten-ton stones, from 1 to 2.5 metres high and are generally of laterite. I have only just noticed there was a quick critique of my review posted here. I think Dr. Emeagwali is right to highlight the statement I made, though I must admit it was more to do with my muddled way of presenting my thinking, than actively setting out to provide some miss-information. What I was trying to suggest was that within this specific area of Senegambia the remains of indigenous sites are not particularly visible. Of course there are a large amount of indigenous sites across Africa, many of which are featured on the World Heritage List and Dr. Emeagwali is correct to highlight a perceived ignorance of these wonderful examples of our shared heritage. Though I hope she will accept that this wasn't something I was attempting to perpetuate, more that I was just a little clouded in my wording. In the spirit of constructive criticism though could I ask that perhaps Dr. Emeagwali review the presentation of the website she suggest looking at. There seems to be a wealth of information contained there but it is rather hard to find what I am looking for and even more difficult to read due to the sites rather unique formatting. ".....and it is also a fairly unique in African terms as there are few monuments of this age in this part of the world, reflective of the migratory nature of the peoples of West Africa." Although I appreciated the overall commentary on the visit, the above statement is a rather erroneous bit of misinformation about Africa's past during the era cited..I suggest that the author should pay a visit to 'www.africahistory.net' for some of West Africa's monuments which include 1. fortifications 2. ancient city walls 3. irrigation terraces 4. obelisks 4. suspension bridges 5. adobe mosques 6.historic tombstones. The Dufuna boat of Northeast Nigeria is indeed about 7000 years older than the stone circles, and although the boat and the Malian pot of 9370BCE are not typical monuments they should be noted as well. The site itself sits just outside the village of Sine Ngayène. The advisory body report talks about the great addition of a small information/ visitors centre and fences around the outside to protect the stones from grazing animals. When we arrived in the village it soon turned out that the visitors centre was not open. We were then quickly joined by the majority of the male population of the village. They had possession of the key from the village elder and we proceeded to negotiate an entrance fee, we ended up paying 10,000 CFA (€15 approx in Dec. 2009). I don’t think they received that many visitors, and quickly took an interest in the “luxuries” we had, I have never seen someone so interested in an Advisory body report or set of maps, and they quickly shuffled these away, seemingly more interested in the paper than its content. They turned out to be very informative and friendly guides to the site. When we got into the site it was clear that the lack of grazing animals had led to the site getting very overgrown. The grass has reached waist height, and as the stones were not much taller than this you could only really see the tops of some of them. The locals then proceeded to give us a very detailed tour of the circles (it was in Wolof so having someone who could translate would work out to be exceedingly useful in fact almost a necessity when visiting the site). They highlighted the discoveries made by teams of archaeologists, as well as the local ideas about their origins and uses. They spent a large amount of time explaining the double circle at the centre of the site, explaining that there were bodies and a large amount of funerary goods buried with it. It was local custom to believe this was the burial of a King. In another part of the site they showed us several tumuli where more indiscriminate burials took place; our guides suggested this was just less noble people however there are also thoughts that it could be the result of a plague or even human sacrifice. As Paul states these sites are not as majestic in size as Stonehenge however there is a very large concentration of them in this area and it is also a fairly unique in African terms as there are few monuments of this age in this part of the world, reflective of the migratory nature of the peoples of West Africa. Indeed the people who now inhabit this area are in no way related to those that built it. This therefore means that knowledge of the reason for their construction and original use cannot be confirmed. This was an exceptionally rewarding trip, it was a chance for us to see a small area of rural West Africa devoid of running water and paved roads. It is the densest cluster of stone circles inthe world and the site at Sine Ngayène is the largest single site, also nearby is the quarry from which they were hewn, therefore there is no doubting the validity of its place on the list. There was a small concern about the management of the site. It was all but derelict, the locals were unhappy about the distribution of funds from ticket receipts, (they didn’t receive that many visitors anyway due to their remote location) and pretty much went on strike. They have tentatively agreed to maintain the site and have already clear a small corner of it of long grass. However many of the stones are somewhat obscured by the overgrown pasture. Once this is pruned back it should hopefully reveal the full glory of the site. It was great to note the 2006 addition of the Sene-Gambian Stone circles since we had paid an interesting visit there back in 1984. Much of our travelling took place before UNESCO conceived “WHS” (or at least before it “took off”) and it can be very annoying to discover that a “new addition” is only a few miles or even yards away from a place already visited (especially if we are unlikely ever to return!). Conversely there is a slightly smug pleasure in discovering that all the effort to visit some obscure site in days past has, in a sense, been additionally “rewarded” by the selection of that site as being of “universal value”! We travelled up-country from Banjul for around 5 hours by “bush taxis” to reach Georgetown. (Now renamed Janjanbureh). This is situated on an island in the Gambia River and its crumbling reality significantly belied its rather grandiose name (In 1983 this overgrown village only had a population of around 7000). The Government Rest House provided clean and comfortable accommodation and the bureaucracy and social interaction with local officials whilst gaining permission to stay in it added to the experience. I understand that a hotel (“Bird Safari Camp” - complete with “the only swimming pool in the area”!!) has now been built just outside the town. The nearest Stone circles are at Wassau on the north bank so another ferry journey was required. On the far side a motley collection of bush taxis waited to fill up but time was getting on (we visited on the same day as we travelled from Banjul and moved on to Senegal the next day) so we agreed to hire one of them for the entire journey – it was only about 25 kms. The site (photo) consists of a number of circles made up of 10-25 red/brown stones between 1 and 3 metres high. The circles are apparently not laid out randomly but form lines and other geometric relationships. They date to around 750 AD (+/- quite a bit!!). When we visited there was little sign of tourism – some wire around the site and an unoccupied entrance hut. We were joined by some bicycling locals but otherwise had the site to ourselves. I understand that a small Museum was built in May 2000 with assistance from UNESCO, probably as part of the plan to achieve WHS inscription (Apparently Gambia first tried to gain inscription in 1995 but failed due to lack of buffer zones, management plans etc etc!!). 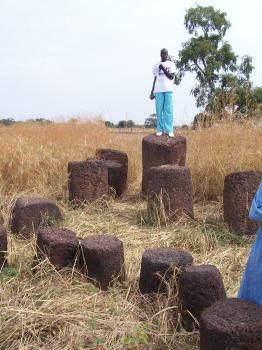 The other Gambian-inscribed Stone circle site is at Kerr Batch a bit further west from Wassau but we did not visit it. Gambia seems to be developing the Circles as a means of persuading at least some tourists to visit beyond the Banjul area. If you are in Gambia I would suggest that it is well worth making the trip using the circles as a reason if not as the sole objective. This particular site by itself is no Stonehenge but is representative of an enormous area of such monuments comprising over 1000 circles and around 29000 monoliths! 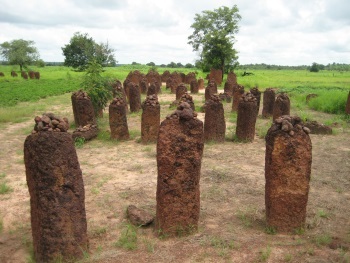 It is interesting to ruminate on the “convergent” aspect of human cultures vastly separated in terms of era, geography and technology (the Gambian stones were fashioned with Iron) which leads them to set up stones in circles.